A few months ago, I went thru my fabric stash and wrote up index cards with a little swatch of fabric, fabric name, purchase place, fabric content, width, and yardarge, plus notes on shrinkage, dye running, my intention when I bought it (if I can remember), and what I might have used it for previously. I put all my little cards in recipe boxes. Well, I was at the drugstore with my daughter, and I saw these little binders for index cards. So I have to go back thru the index cards and punch holes in them which means that I, usually, have to move the little swatch of fabric. Last night, I went thru the silks and polyesters, getting them ready to be put into a little binder. My son slept very poorly last night. The swimming pool is closed until further notice. My serger presser foot is broken (again!). I’m having a hard time concentrating at work, so I’m typing this instead. 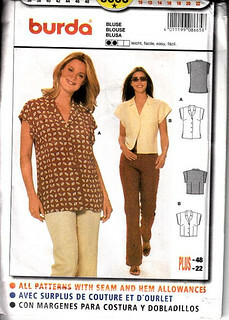 Pattern Description: Button front blouse with cap sleeves in crop and tunic lengths. I made the crop blouse. Pretty easy. This was my first top with a collar, and I was a little confused about how to do it. I followed the instructions, but I needed input from my books. LIKE: I decided to make this top after reading Alana’s Review. Like her, I wanted a fitted nursing top. The conventional nursing tops are too sack like. The fit is very nice. It’s not a close fit, but enough to give your figure a little definition. Rayon/Acetate blend from Joann’s clearance section. It’s a very loose weave, rather unstable, with beautiful drape, and it’s very soft. I increased the dart size. I lengthened the shirt by 1″. I edgestitched the collar and lapels. I think that makes for a nicer finish. Next time, I’ll have to use a smaller size in the shoulders, but other than that, the fit is perfect for me. Those of you who are still perky might want to note that I did not have to lower the bust dart, and I usually do lower them 1 to 2 inches. YES, YES, YES!!! YES! And not just for breastfeeding moms, either. It’s a very flattering top. This is a good, all around top. 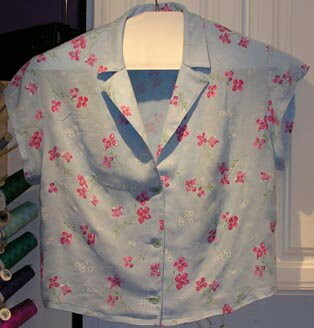 UPDATE:I made a second blouse out of batik cotton shirting for the stash contest. I made the top a size smaller in the shoulders than the first one. I was going to make it even smaller, but looking at the picture, I’ve decided not to. In Deepika’s blouse, out of cotton, she thought the sleeves stuck out from her shoulders. 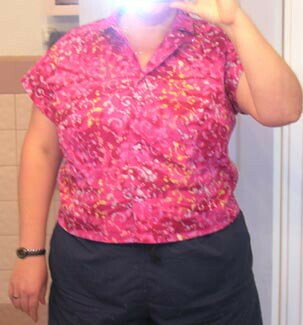 They don’t on mine, and I like the look of the current blouse even tho the shoulders seem a little big. I lowered the dart. I must of worn a more structurally sound bra when I made the first one because I definitely needed to lower the dart. I increased the side seam at the bottom by 1/4 inch at every seam. I think I might increase it another 1/4 inch. It humps up in back. I almost finished Burda 8665. The presser foot lift is broken again on my serger, so I couldn’t coverstich the hems. There were 2 problems … well, at least 2 problems, with that burda magazine pattern. I chose the pattern in a size too big. I’m a 44 not a 46 on top. The fabric was too crisp. The pattern needed a very drapey fabric. The linen/rayon burnout is working out nicely for Burda 8665. I started on the tops from Simplicity 5633 OOP. The pattern calls for a facing. I’ve been reading Sewing Secrets From the Fashion Industry, and that book recommends replacing all your facings with bias binding. Naturally, I’m out of fabric to do this for these tops. It was the excuse I needed to place an order with The Sewing Place for some white batiste, 2 neue mode patterns, and the fasturn set. Due to structural problems in the deck, the pool is closed until further notice! What am I going to do? I am probably the only swimmer who is slower when flipping than when not flipping. I tried to flip at every turn. I’ve improved in that I am no longer afraid to turn. But for most of the turns today, I turned all the way and stood up. I then realized that if I twist a bit, so that I come out of the turn on my side, I’m much more comfortable pushing off the wall than when I’m on my back. Once I made that change, I was doing better. It would help if I could get close enough to actually touch the wall on every turn, but I am making progress.